Part of my early years was spent in a small Southern Missouri town, where everything was pretty basic. I lived with my grandparents in a no frills little farm style home. All of the houses were a lot alike in functionality, including the fact that they had rain water collection systems. “Rain water, my Grandmother said is the purest water that you can have”. We don’t live in those simpler times, but there are a lot of people that are returning to some of the common sense roots methods, which includes the harvesting of rain water. Ever get caught in a rain storm and get soaking wet? Did you notice how soft your hair and clothes became after they dried? That’s because there aren’t any minerals or chemicals in rain water. 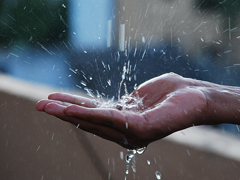 It is precisely this reason that rain water is coveted for so many uses. Since almost every area of the habited world gets some level of fresh rain, it is a common sense topic to collect and use the rain that normally would just run off. The internet is filled with companies that will sell you very excellent rain water collection systems. The type of harvesting system is going to be a bit dependent upon what you intend to use the rain water for. Larger systems or multi-location systems tend to be for farms and large square footage gardens. Smaller systems are generally used for around the home smaller garden scenarios. The typical harvesting system is not generally used for drinking, but if this is a direction you want to take, you will have to make sure that you comply with the methods of collection and the materials that are used in all areas that the water touches. Some materials leak toxins into the water which can be detrimental for human consumption. Do the research you need on how to collect and store potable water. Harvesting water includes some fairly basic topics: where the water is going to be collected (most of the time it is the roof), a method that the water will convey through (pipes, gutters, and spouts), some form of filtering method, a collection container and a way to get the water out of the container (spigot or spout). If you will be collecting water from a roof, examine the materials that the roof is made of. Some older roofing materials contain asbestos and other chemicals that are completely toxic. If you have asphalt shingles small particles of the shingles will break off and enter into the water. You may want to have an exterior collection area that bypasses the roofing and falls directly into a roof mounted container. There is some rain water harvesting cisterns that are made of completely safe plastics and will last a long time. You will not want to allow water to remain for long periods of time, even in closed containers. There are microbiological test kits that you can use to test the level of bacteria; however it’s always a good idea to use a standard treatment kit on the water. This will not allow bacteria or algae growth and will be safer for non-potable purposes. There is growing popularity in rain water harvesting and some counties offer inexpensive kits that a homeowner can purchase and use. As long as you abide by certain common sense safety tips, you should be able to harvest rain water safely.